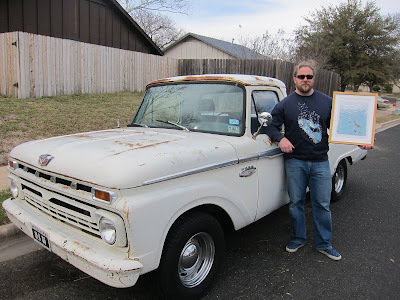 Mat Pringle: 'The Day Texas Sank to the Bottom of the Sea' awesome fan! 'The Day Texas Sank to the Bottom of the Sea' awesome fan! Last week Gamble Anderson sent me this photo of his brother standing next to his truck with my sweatshirt on and a framed print of 'The Day Texas Sank to the Bottom of the Sea'. Needless to say it made my year. The sweatshirts are sold out now but I've got a couple of prints left - here.